The exceptional systems in European exotic super cars require specialized care that low quality car diagnostic equipment cannot offer. The Leonardo Diagnostic Tool is a dealer level high-quality tool that can not be matched by any other for Ferrari Maserati & Lamborghini repair. One of the main things that sets us apart from other scan tool companies is training classes. We offer training classes ( for a daily fee) on the strategy of Ferrari, Maserati, Lamborghini & Aston Martin and how the Leonardo tool will put you on the cutting edge of automotive diagnostic repair for high end super cars. Our vehicle diagnostic equipment is designed and fabricated in Italy by Accinni SRL. 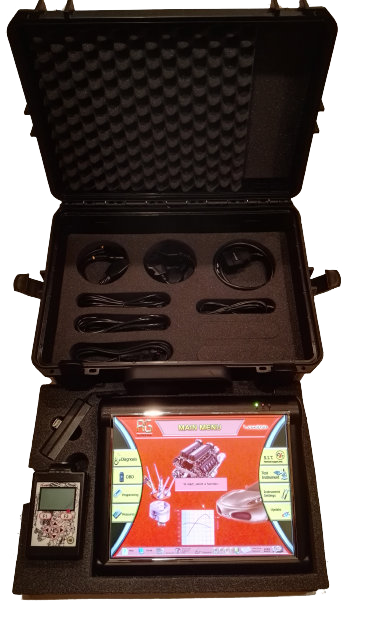 We trust Accinni to deliver the best car diagnostic tools because of their extensive knowledge and experience of almost 30 years with European super car diagnostic equipment. Together we have teamed up to supply independent workshops , dealerships & race tracks the ultimate diagnostic tool for their cars & clients around the world. Always on the cutting edge of development you can trust us with many years of experience to give you the utmost in after sales service & commitment to keeping these cars repaired in dealer fashion. A single point of contact – You receive personalized one-to-one service from an experienced account manager. Flexible Financing Structures – We include terms and a payment schedule structured to fit your cash flow. Easy documentation and processing with 2-4 hour credit decisions and a simple application process. In most instances personal guaranties are not required, except in rare situations. If the initial information we retrieve on a customer is not sufficient for approval, additional information may be required. Secured online application. Buy now! For Canadian customers, processing time typically takes 48-72 hours on approved credit. This does not include local state taxes and origination fees, and you are subject to credit approval. Please contact us at 360-410-1949 for more details on financing or if you have any additional questions.